Unearthed by Amie Kaufman and Meagan Spooner launches a new series from the dynamic duo set in outer space. I went into this expecting a few similarities to the These Broken Stars series but ended up pretty surprised. However, I’ll also put in the caveat that it’s been a long time since I last read a book from that series. Actually, I should probably get around to finishing the last book. Anyways, Unearthed is a thrilling read featuring dual narrators and the adventure of a lifetime. So, this book follows Amelia and Jules as they are dropped on this planet called Gaia. Amelia is a scavenger. Jules is an academic. Despite these different aims, the two team up. Together, they will solve different puzzles to unlock the secrets left behind by an extinct race called the Undying. The hope is that the technology of the Undying is what will save Earth which is struggling due to climate change and lack of fresh water (hmmm if that’s not the most familiar thing!). Anyways, the comparisons to Indiana Jones are pretty merited in this case. Amelia has lived a rougher life than Jules. She’s small but streetwise. Initially, Jules kind of underestimates her. However, Amelia proves her intelligence and that she’s actually really smart in spite of her circumstances. She believes she was picked to go to Gaia as a scavenger because she passed all these tests. Amelia cannot come back empty handed. She needs the technology and the money resulting from it in order to save her sister, Evie. Amelia is the sort of character who will do whatever it takes to save her sister, who is priority number one. She’s consistently helping herself and Jules get out of scrapes. I am hoping that as the series continues the phrase fortune favors the bold will eventually hold true for Amelia. In contrast to Amelia is Jules. He was raised in Oxford in England. Jules is posh and polished. He also has a special connection with Gaia. His father decoded the transmission sent to the Undying which helped lead mankind to Gaia. Unfortunately, his father also realizes later on that the transmission contains a warning of danger and apocalypse. Jules makes it his mission to vindicate his father while on Gaia and prove that this planet will only lead to the downfall of mankind. At first, it is like he has no street smarts and is pretty dependent on Amelia to help him. By the end though, we see how their strengths really complement each other. I just enjoyed how Jules’ understandings of linguistics actually had practical application in this book. Honestly, I think that Unearthed is much faster paced than These Broken Stars. As Gaia is new to both the main characters, the exploration feels natural. I like that everything was undiscovered for both those characters in the book and those of us reading the book. There’s also a reference to La Roux which is neat. That’s the only reference though and you do not need to read the other series to know what is going on in this book. I also liked that there was a lot of attraction between Jules and Amelia, but ultimately it is a slow feeling build between them. It is exactly how I like to read romances developing. My time with this book was enjoyable, especially this giant twist that happens. I am ready for book two! 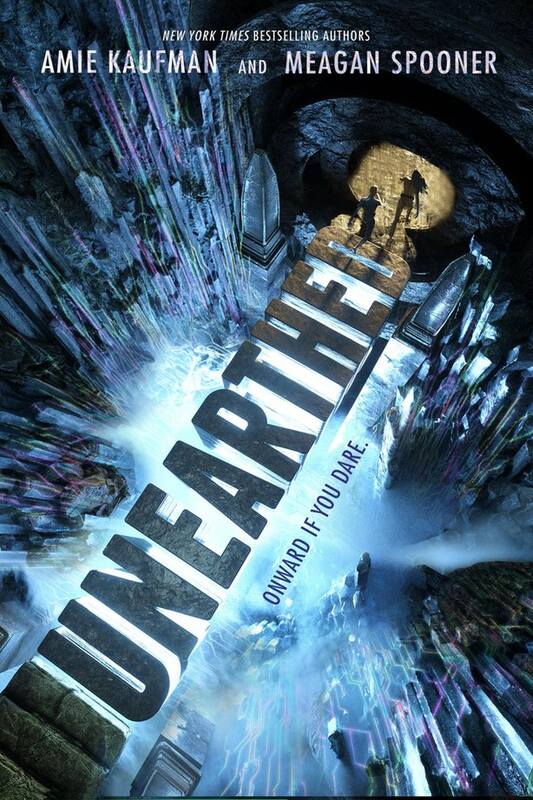 I agree that Unearthed was more fast-paced than the others series, but for me, I don’t know if that was better. I got exhausted by all of the bombshells toward the end! I definitely agree that the characters were fantastic and I loved how different they were from each other. I had the audiobook and both narrators did a great job conveying the personalities.